Nobody wants to be a loser. 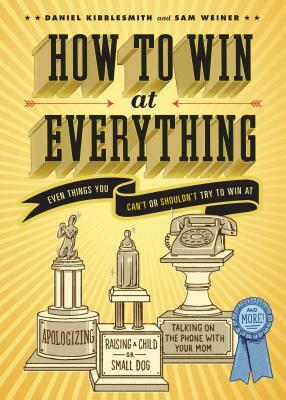 With this revolutionary new handbook, readers will learn how to win at literally everything*—even things that aren't contests, and that you can't or shouldn't try to win at, such as dreaming, apologizing, and talking on the phone with your mom. Crucial illustrated advice and instruction guides would-be winners through activities including bird-watching (start by spotting common species like pigeons, or dogs), job interviews (maintain eye contact: very smart people do not need to blink), and many more scenarios for success. In sharing their hard-won knowledge, the authors—noted experts at this sort of thing—help readers become the future winners they were meant to be. Daniel Kibblesmith has written for the Onion News Network and Splitsider, produced video for Funny or Die and The Best Show on WFMU, and appeared on Bravo's Millionaire Matchmaker. He lives in Chicago. Sam Weiner is a staff writer for the Onion News Network. His work has appeared in McSweeney's, Splitsider, on NPR's Marketplace, and on stage at Chicago's Annoyance Theatre. He lives in Chicago. "This charming little how-to guide by Chicago-based comedy writers Kibblesmith and Weiner makes a great gift for the clueless and unaccomplished friends in your life (let's face it, you have plenty of those!). Before you have the chance to gift-wrap it for them, it's worth thumbing through yourself. "